This sign of the Wild Dreamers Association I found in Lisbon, Portugal. I do not know what it is about. Maybe someone can explain that to me? i dont know if you have ever gone there during the night, but it is simply a place to drink, smoke and eat free popcorn :) really cool inside, and really cheap. 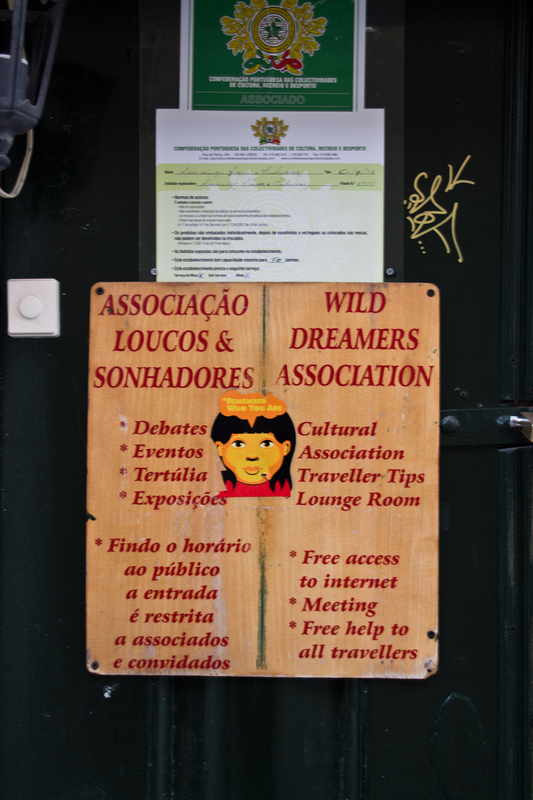 though, i dont know if 'wild dreamers association' should be the name of the place or it is just randomly hanging there. Thanks for your reply. For some reason I only spotted it right now. I wasn't around there when it was open. I just saw the door and the sign and thought it was an interesting piece of culture. Maybe I get a chance next time I am in Portugal.